Symposium on Flat Ethics | Larval Subjects . 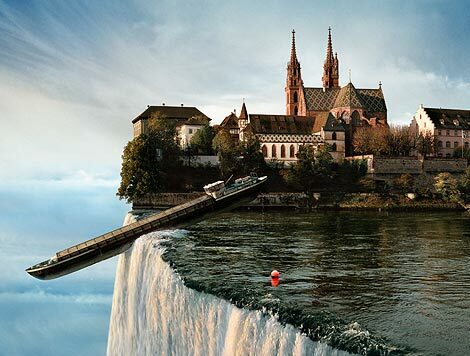 There have been a flurry of posts across the blogosphere discussing the issue of flat ethics. Over at Misanthropology, Craig has a pretty harsh rejoinder to my initial post on flat ethics. I find myself in a pretty interesting position, striving to respond to the humanists who are worried that OOO/NFM and flat ontology imply a denigration of humans and human political issues, while responding to critical animal theorists who are worried about anthropocentrism. My initial post on flat ontology and flat ethics was intended as a response to David Berry and Alexander Galloway. I tend to encounter Craig’s post as the perspective of a psychotic (in Lacan’s sense). But before that is taken pejoratively, maybe Craig is right. What would it really mean to say that Craig is psychotic? It would mean that he is no longer identified with the human perspective, with the human set of attachments and commitments, but has deterritorialized to such a degree that he is a creature that is able to participate in dialogue, while no longer being “one of us”. If this is the case, his perspective, arguments, and theorizations are indispensable to this discussion. Indeed, this is why we should be suspicious of categorizations like “psychotic”, that seem more designed to exclude and alienate, than to dialogue. Craig is the true animal in this debate. In response to Craig’s post and my post, Scu jumps in expressing his worries about discussions of conatus, to which I respond here. Today there have been a flurry of further posts. Over at Struggle Forever, ethographer Jeremy Trombley has a great post up arguing that the question of ethics only arises relationally (something I agree with) and making nods to an ecological conception of ethics where we have to attend to the ecological relations between entities in making judgments about what ought to be done. While not directly jumping into the discussion, both Adam Robbert of Knowledge Ecology and Andre Ling have written two terrific posts discussing politics and ethics, vis a vis OOO, Harman, Morton, Stengers, and Latour (here and here). What Alex and Serries remind us is that we’re never strictly the origin of our own actions, but that often we’re the object of the agency of nonhumans such as the soccer ball. If this point is so crucial and deserves to be the starting point of discussion on these issues, then this is because it significantly complicates our notion of agency and just who and what counts as an agent. Too often these discussions have proceeded as if we know what a human is and can univocally distinguish between humans and nonhumans. The discussion has unfolded as if the issue is simply one of whether or not we should extend agency to nonhumans and, if we do extend agency to nonhumans, if we should restrict that agency to animals, or all the way to plants, microbes, quartz crystals, and stars. The problem is that it’s not clear that we even know what a human is (a point that was made well before OOO). Thinkers such as Donna Haraway with her cyborgs, Andy Clark with his extended mind, and Latour with his alliances of actors, Barad with her agential realism, Bennett with her distributed agency, and Alaimo with her trans-corporeality have significantly complicated our understanding of just what a person is. Is the person with a seeing eye dog the same type of person as a person with a spear? These theorists suggest not. Indeed, Marx and Engels, in The Communist Manifesto, go so far as to argue that the peasant farmer and the factory worker belong to two entirely different species. Here they sound a lot like Deleuze and Guattari who say that we should distinguish beings by their capacities and that a work horse has more in common with an ox than with a race horse. If this is true– and I’m necessarily committed to this thesis insofar as I hold that entities are individuated by their affects, powers, or capacities –then we need to take care of speaking about “The Human” as if there is some univocal category defining a class here. We just won’t be able to generalize in this way. Consequently, discussions of whether or not doctrine x (OOO/NMF/SR) is undermining human agency becomes rather moot, because “human” doesn’t form a real category to begin with. Instead, we have a proliferation of cyborgs with various forms of agency. 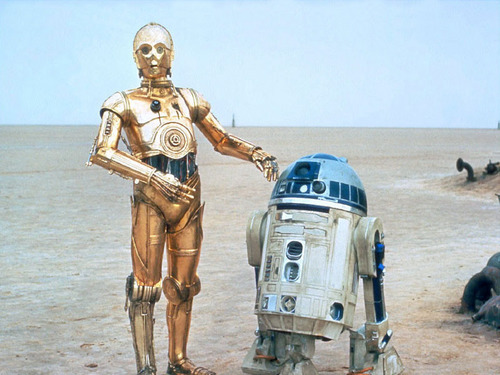 R2D2 and C3PO are both sentient beings with agency, but they are nonetheless different beings insofar as they have different powers or capacities. Likewise with computer programmers and carpenters. Second, as Serres’ example of the soccer ball as a subject where humans are quasi-objects for it– where the soccer ball is the seat of agency and the players are patients; in part, anyway –suggests, we need to develop an adequate notion of agency. What sorts of agency are there? What agency do we have? This is what’s so weird about my friend Alexander Galloway’s post linked to above. He argues that Harman’s OOP is somehow undermining agency. Yet as problematic as the category is, Harman has never claimed that human beings lack agency, he has merely said that there are other entities that have agency as well. Yet aside from this, suppose OOO/NMF theorists do limit human agency by showing that we are not entirely sovereign in the ways we thought? Galloway’s thesis seems to be that we shouldn’t acknowledge what is true about both what our agency is and the limits of our agency– a point Hasana Sharp develops nicely in Spinoza and the Politics of Renaturalization –and instead proposes that we should just continue on with the fiction of unlimited sovereign agency on the part of agencies. Here Galloway’s criticisms sound a lot like Habermas’s protestations that we shouldn’t inquire too deeply into cognitive science, psychoanalysis, and neurology because we might discover things that undermine our conception of the liberal, Enlightenment subject. This sounds like a recipe for disastrous politics as it entails that we’re left without a genuine understand of what we’re facing and what we can do. Finally, third, we need to determine just what intelligent agents populate social assemblages. We need a cartography or mapping of what entities exist in particular social assemblages. This is crucial to any sound emancipatory politics. Have we properly counted the entities that belong to the socius? Or are there all sorts of dark agencies that we haven’t counted? The liberals among us are accustomed to– following Thatcher –seeing society as composed entirely of humans; whatever those might be. OOO has proposed the far more disquieting thesis that entities such as corporations, states, armies, groups, etc., are also agencies independent— while not being able to exist without –humans. My college, for example, would be a sort of mind-body independent of all the students, faculty, and people that work there. And here it goes without saying that these entities have aims of their own. Claiming that corporations are intelligent mind-bodies in their own right is not a happy thesis. Many of us would like to see the extinction of species like corporations, and Marx dreamed of the extinction of states. To acknowledge that such entities exist, that they are agencies pursuing their own aims, is not to suggest that they ought to exist, that they have a right to exist, or that they are good. Rather, it is to recognize parameters of a problem so that we might begin devising strategies for responding to this problem. Sticking our head in the sand and pretending they don’t exist or that we’re the ones calling all the shots does nothing to resolve the problem. Reference to problems here is apropos. The bottom line is that none of us working in the frameworks of OOO, NMF, posthumanism, critical animal studies, disability studies, queer theory, SR, Deleuze and Guattari, etc., are quite sure where we’re going. When correlationism is overturned and one refuses anthropocentrism, the question is how this Riemannian revolution forces us to pose all the questions of epistemology, ontology, ethics, aesthetics, and politics, anew. Like Lewis and Clark, we’re cartographers exploring a new terrain, striving to determine where the problems lay, what concepts need to be invented, what tools need to be invaded, what new sensibilities must emerge, what new capacities or powers must be developed, and what old tools, assumptions, and ways of thinking must be abandoned. We are exploring this terrain collaboratively, responding both to each other, to those we don’t directly talk to, and to the nonhumans we encounter in the world about us. In other words, we are proceeding in a flat fashion. it seems to me that there are some parallels your criticism of galloway’s so-called fiction of unlimited sovereignty and your writings on dennett and free will (this post in particular: https://larvalsubjects.wordpress.com/2011/10/20/cultivating-freedom-occupy-wall-street/). couldn’t we easily acknowledge that there is some sort of deficiency in human sovereignty yet believe in its unlimited agency — which your post seems to indicate that it is politically motivating? but perhaps there’s a difference between political mobilization and the “disastrous politics” you refer to in your post. i’m having a hard time conceptualizing, however, what those consequences would be. The debate of a shark and a human child is an interesting one. But what if we take in consideration something non-living, something that cannot be anthromorphised (this brings out also the question of facialization, as discussed by D&G in A Thousand Plateaus, not to mention the zombie hype, where all zombies must die, but in fact, what are they doing is just their need), e.g. city. In Russia and in many ex-communist countries there are many cities, which are named град герой or mesto heroj (city-hero), where one can surely attach the naming of it to the people, living in it. But what if we look from another point of view, from the view of the architecture, of curves, of walls, which could prevent enemies from easily entering the domain of it’s inhabitants. And on the other hand it was also severly damaged. I think we have in this case a complex relationship between human significations (no doubt, idealogical and such), but there is something else, because cities not “serving” the home army, didn’t become cities-heroes, the people were not treated better and I guess, the subject-object relationship was not so clear as we thought before. Here are a few late thoughts.